At the outbreak of the Civil War, Joseph R. Hawley, publisher of the Hartford Evening Press and a founding member of Hartford’s Republican Party, organized the first company of citizen soldiers to enlist in Connecticut’s volunteer army. In the summer of 1862, President Lincoln called on the nation for 300,000 more Union soldiers and Hawley’s assistant editor Oliver R. Post answered the call. 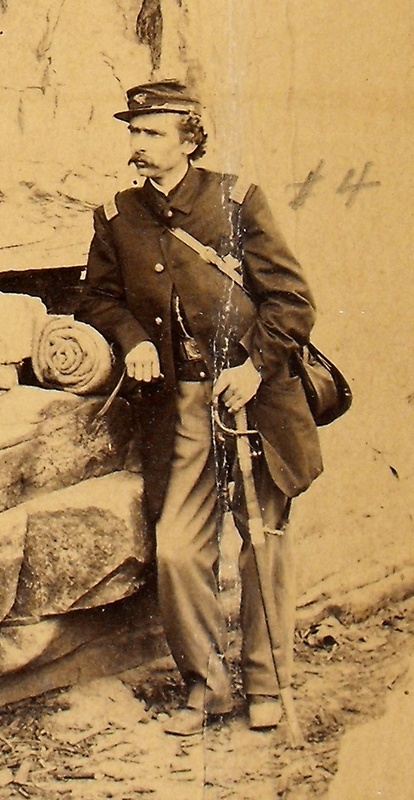 Post mustered into the 20th Connecticut Volunteer Infantry as a lieutenant on September 8, 1862 and was promoted to Company D as a captain the following February. While his men were moving to the rear, Capt. Post returned to the front to retrieve some blankets he had left behind and was shot by a musket ball that nearly severed his sword belt. As he was moved to a divisional hospital in the rear, he implored his Lieutenant to “take good care of my boys.” Post died of his wounds the following afternoon. The sorrowful duty of writing to Post’s wife Mary fell to his friend and follow officer, Capt. Ezra Sprague. Dear Madam: In compliance with the last request of my deeply regretted friend and comrade, it becomes my painful duty to inform you of the death of your husband. And thus has passed away another noble spirit, to be added to the thousands who have gone before, sacrificed upon the altar of Our Country. If aught can be offered as consolation in this, your hour of deep affliction, perhaps it may be that he died for his country while nobly performing his duty. On the day of his death, most of the Union and Confederate dead were buried on the field of battle. The 20th Connecticut had Capt. Post’s body embalmed and buried him in the graveyard of St. James Episcopal Church in Marietta. It was the intention of his fellow officers to have his body returned to his family in Connecticut in the fall. They then marched off to the Siege of Atlanta and were one of the first Union troops to enter the city after its surrender. 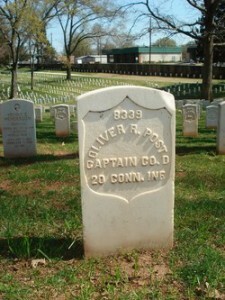 At the end of the war, Oliver Post’s body remained in Georgia. In 1866, Henry Cole Greene, a Union loyalist and Marietta businessman, donated the land that is now known as the Marietta National Cemetery. Oliver Post’s remains were re-interred there along with approximately 10,000 other Union soldiers who perished in nearby battles. Though his ringing voice is no longer heard among us, and his pleasant smile, ready wit, and quick suggestion, are lost to us forever, yet he will march with us in memory until our bivouac fires of life are extinguished, and we go to meet him on the far-off shore. He died happy, assured that the future shone bright for him. Read Capt. Sprague’s letter to Mary Post here. 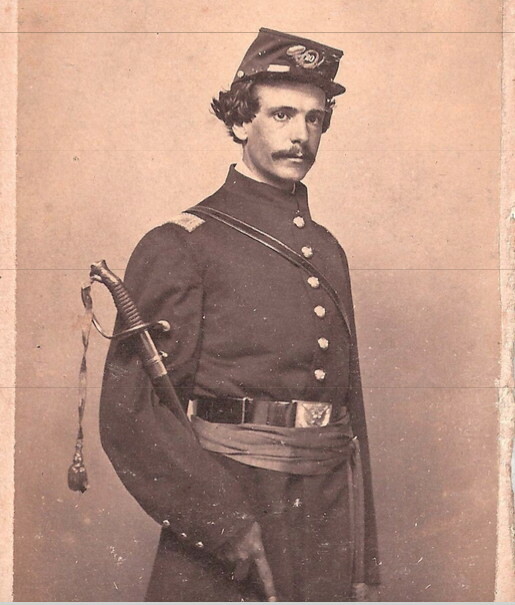 Official report of Philo B. Buckingham, Lt. Col., 20th Connecticut Volunteer Infantry, to General Horace J. Morse, Adjutant General, State of Connecticut, August 6, 1864. Connecticut State Library RG 13. Captain Ezra Sprague to Mary Holcomb Sprague, July 22, 1864 as reprinted in the Hartford Evening Press, August 2, 1864. Record of service of Connecticut men in the army and navy of the United States during the War of the Rebellion. Hartford, Conn.: Press of Case, Lockwood & Brainard Co., 1889. Capt. Oliver Rawson Post, was my grandmother’s, great grandfather. I really appreciate the work you are doing, not just for Capt. Post, but all Connecticut volunteers of the civil war. These men fought and gave up so much for there country. Its people like you that keep there memory alive. I always tell the young people, Batman is not a real hero! Real heroes wear dog tags! Mary, great job. Thanks for posting again. Mary, this post is both heartbreaking and inspiring. We stand on the shoulders of Connecticut patriots like Oliver Post, without whom we would not enjoy the privileges and freedoms guaranteed by the constitutions of our great state and country. I hope in these uncivil times we all take a moment to recall those who served in the Civil War, and be reminded of the great sacrifices our forebears made so that we may live our lives in freedom. Thanks for this.